It has been suggested that this article be merged with Pakistan. (Discuss) Proposed since May 2014. Pakistan's international borders are the borders of the Islamic Republic of Pakistan. It borders the People's Republic of China in the north (Xinjiang), and the north-east (Tibet Autonomous Region), the disputed territory of Occupied Kashmir which was part of the British Indian territory until 1948 is also included, that borders the People's Republic of China to the east. 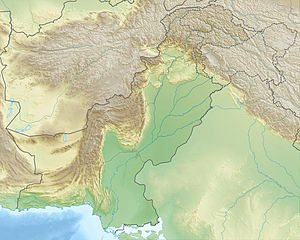 Pakistan borders the entire eastern length of the country with the Republic of India and on the south towards the Arabian Sea, to the north-west Pakistan is separated by fourteen kilometeres of a narrow strip of the Afghan-occupied Gorno-Badakhshan territory called the Wakhan Corridor which extends between North Pakistan and Tajikistan. The Islamic Republic of Afghanistan is to the west and north, and Persia is to the southwest. Pakistan also shares to the extreme south-west a marine border with Oman. ↑ "Pakistan: Geography". US Country Studies. Retrieved 2008-05-05.